I started reading up on what is required to hike in the Grand Canyon. 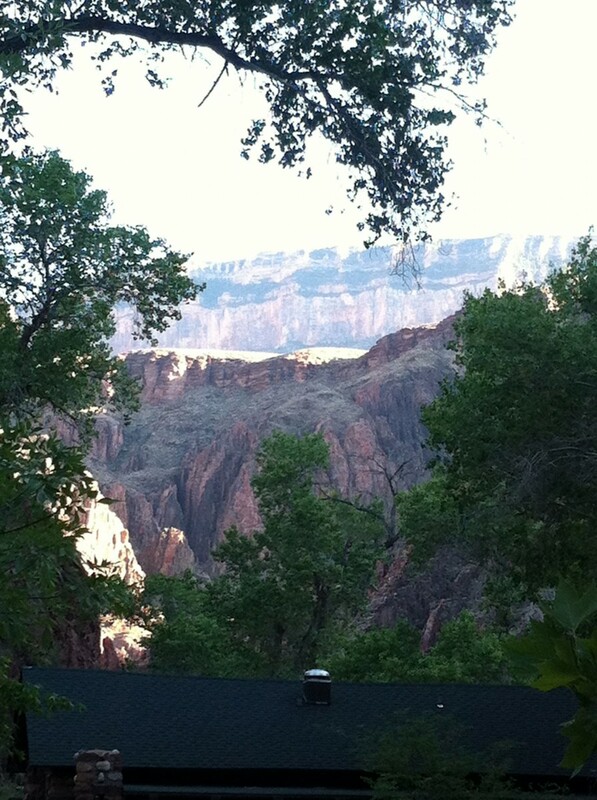 First, we made our reservations one year in advance to stay at the Phantom Ranch at the bottom of the canyon. More reading revealed that Lance Armstrong’s physical ability would be ranked at a 10, and if you plan to hike the canyon, you should be at least at a 7. You will also need to carry a backpack weighing anywhere from 10-20 pounds. Hummmmm! I will need to increase my workouts. ( I never got to the 7 ranking, but I did get more physically fit). Finally, the day came. We got up early and started our hike down from 7,262 feet on the 7 mile ridge line of the South Kaibab Trail. It was just as they said, SPECTACULAR! As I looked down, I realized how steep the trail really was. There were so many switchback I lost count after 10. After a short while, I looked off into the distance and got a glimpse of a small ribbon of green water. The small green ribbon was the Colorado River. There was the goal! I just kept going down and down and down until every muscle in my body began to ache, and I thought I could drink water from a fire hose. I told myself that right after this turn, I will be there, but no, not yet. Keep going. I started to wonder how much farther I could go. The temperature was over 100 degrees, and I was exhausted. I reminded myself of my psychological training. First, I tried using positive thinking. 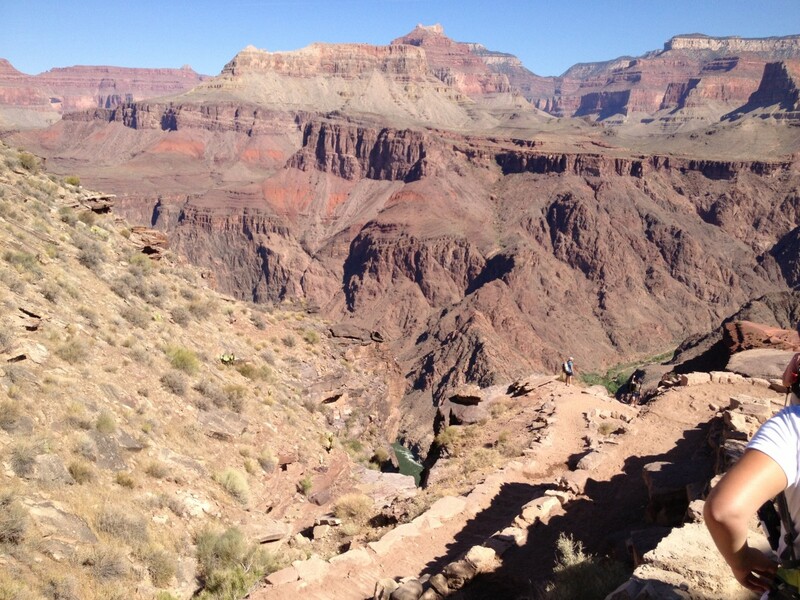 “What an opportunity to hike one of the 7 Wonders of the World, The Grand Canyon”. That helped for a little while. Later, I tried disassociation. I put myself to thinking about the different angles and colors the light caused, or how beautiful the blue sky was with birds flying overhead. I then moved onto mindfulness, focusing on each muscle I used to move one foot forward, then the next. I prayed. Then I tried segmenting. When American rock climber Bev Johnson became the first woman to climb El Capitan's impressive 3,000-foot-high Salathe Wall solo, she said, “The only way to eat an elephant is one bite at a time.” I started trying to break the trail up into achievable goals; next Skeleton Point. After Skeleton Point, on to Tip Off. I tried using old marching songs I had learned as a child, When Johnny Comes Marching Home or Legs, Don’t Leave Me Now. Then I pulled out my final strategy, my mp3 player with all of my music. I was able to get into that zone where you just move and keep moving. Finally, after hiking 4 hours, at 11 a.m. we crossed the suspension bridge of the Colorado River with just a little less than a mile more to the Phantom Ranch. What a beautiful view! Exhilarating!! There was the oasis, The Phantom Ranch! We placed ourselves right in the middle of a stream with cool water running over our tired muscles and stayed there for several hours. How wonderful it all was, the rock canyon walls with the beautiful shades of red, orange and tan. After a great dinner, the realization came to me as I looked up at the sun setting, “I have to hike up out of this place in the morning, can I make it?” Pre-visualization of how I was going to hike up helped to stretch my mental muscles and deal with the feeling of being overwhelmed. Morning came, and we wanted to get moving early to try to get to higher elevation before it became too hot. We were on the Bright Angel Trail by 5:45 a.m. Only 9.5 miles to go. Even though this trail was longer, it was not as steep, and there were more rest areas with water stations. We followed a stream for a long way then came to the Devil’s Corkscrew, fitting name for that part of the trail. Lots more switchbacks. After 4 hours on the trail, we got to the half way mark, The Indian Garden Camp Ground. Going up for me was even more difficult than I imagined and took a lot more strength, both physically and mentally. Knowing that the top 4 miles were the steepest, I was really dreading that segment of the hike. Again, I used my psychic techniques. Every one of them, over and over and over. The hike gave me a chance to remember where I learned some of the songs I was humming in my head. You have a lot of time to think on the trail. I also reminded myself that if I take it slow and steady, I will walk out of the canyon. I can do it. Finally, after 8 hours, I was at the top of the rim again, 6,860 feet. The other people in our group were there to welcome us as we walked out of the canyon. What a feeling of accomplishment! I did it! What a hike! It felt good to stretch and challenge myself. The hike re-enforced how amazing the mind is and the importance of how one thinks about things. It really can make a difference. It did for me!